If you’re like me, you probably hate cereal for breakfast. I love a good wholesome cooked breakfast. 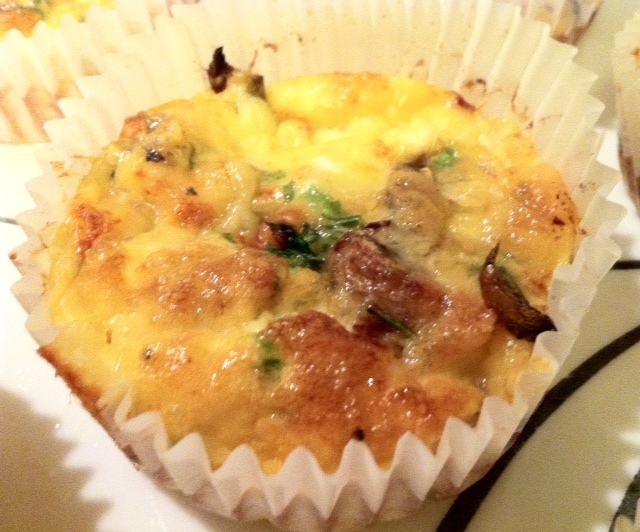 Eggs..cheese…mushrooms..the works. None of that wimpy 2 toasts and a wisp of butter for me. This recipe has fixed my breakfast issues and I am a very happy woman!The quiches keep well in the fridge for 3 or 4 days in ziplock bags and I eat them cold. I’ve used mushrooms, asparagus, cheese and chicken in my quiche, but the fillings are really up to you – use up your leftovers! To prepare the filling, heat a pan. Add a little butter. Fry off your filling ingredients until cooked through. I usually even let them ‘burn’ a little to add a grilled flavour (especially with mushrooms and asparagus). Set filling aside to cool. If you’re not using the pastry shells, line a muffin tray with muffin wrappers. Divide the fillings and grated cheese equally into the muffin tray or pastry shell. Whip up the eggs, cream, water and seasoning until frothy. Divide equally into muffin holes making sure to cover the filling. Pop in a pre-heated oven at 180 degrees for about 20 minutes. When cooked, remove from oven, let cool slightly and enjoy!